With the gratuitous opening sentence, “Keep your eyes on North Korea’s Kim Jong-un.” The Australian’s veteran Foreign Editor Greg Sheridan signals his credential superiority, but soon drops his guard. “ … so far, in relation to the Korean peninsula, Trump has been much more effective than Obama, though there is a kind of heresy involved in saying this in respectable circles.” Oh dear, Mr Sheridan, this is a revealing slip, exposing your own ‘deplorable’ moment. By ‘respectable circles’ you mean circles where Trump is derided and mocked. Perhaps Sheridan feels a tad dirty praising Trump’s effectiveness. But it’s still all guesswork. Here’s my own guess: Kim Jong-un went to Beijing this past week to make a deal in which North Korea offloads (one way or another) its nuclear arms to China in return for Chinese economic aid and support for its bid for a seat at the UN – only in a more complex structure than I am summarising. This deal would include a security package and protection from aggression. He would then be able to negotiate with Trump on the basis of de-nuclearisation and get US support for his acceptance at the UN as well as lifting of sanctions. As for the North Korean / Chinese relationship, Sheridan now says: “…he was profoundly ­estranged from China and its leadership.” Western leaders didn’t seem to think so when they urged the Chinese to reign in Kim over his provocative missile testing. “It seemed that while Kim was defiant towards the US, what he really feared was Chinese influence in his entourage,” writes Sheridan. And guess what? It was only in the past few months that this has begun to crystallise, now that Trump’s strategy is unfolding. Kim Jong-un has made a 360 degree pivot, a U turn, where U stands for denUclearisation. Just a word of caution, though: Kim Jong-un is “committed to the denuclearisation of the Korean Peninsula,” China stated. The Peninsula ….? 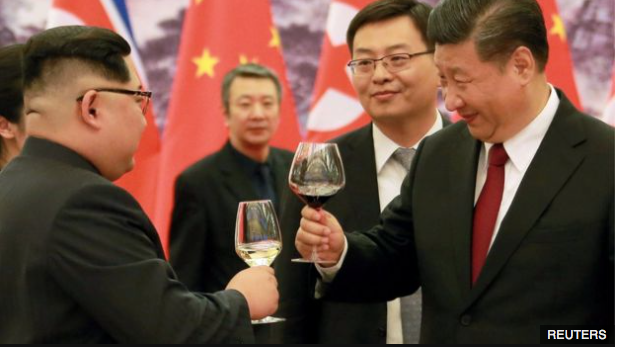 BBC News reported: North Korean leader Kim Jong-un’s surprise visit to China’s President Xi Jinping has left many wondering how it will influence the next move on the global chess board of power. Laura Bicker, the BBC’s South Korean Correspondent wrote: Kim Jong-un is making things right with China at a crucial moment. For months, Pyongyang has been giving Beijing the cold shoulder after President Xi agreed to impose international sanctions. The Kim regime even turned a Chinese envoy away when they tried to visit Pyongyang last year. From China, Stephen McDonell reported: The comments China’s media attributed to both leaders are pretty illuminating if true. Mr Kim reportedly told Mr Xi that because “the situation is developing rapidly” he felt he should come to Beijing in person “out of comradeship and moral responsibility”. What’s next in this ‘global chess board of power’ is anyone’s guess, but commentators like to put that in an authoritative form of words.